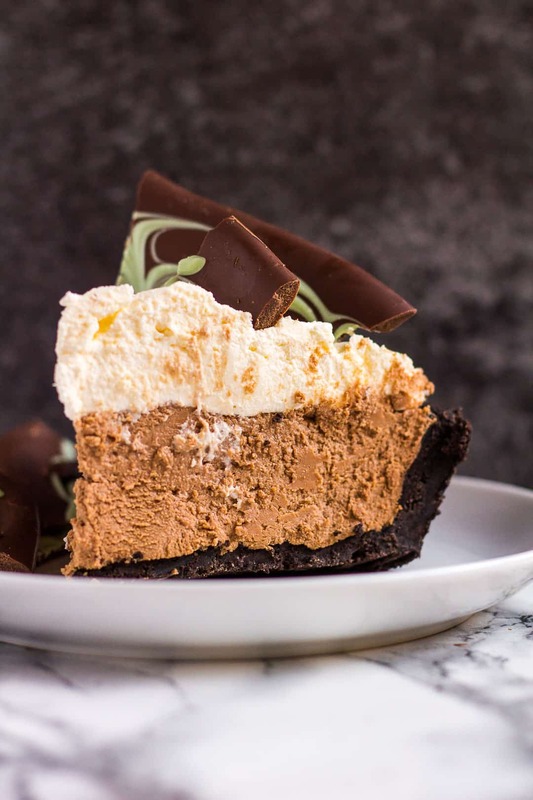 No-Bake Mint Chocolate Cream Pie – A thick Oreo crust filled with a deliciously minty mousse filling, and topped with a homemade whipped cream. 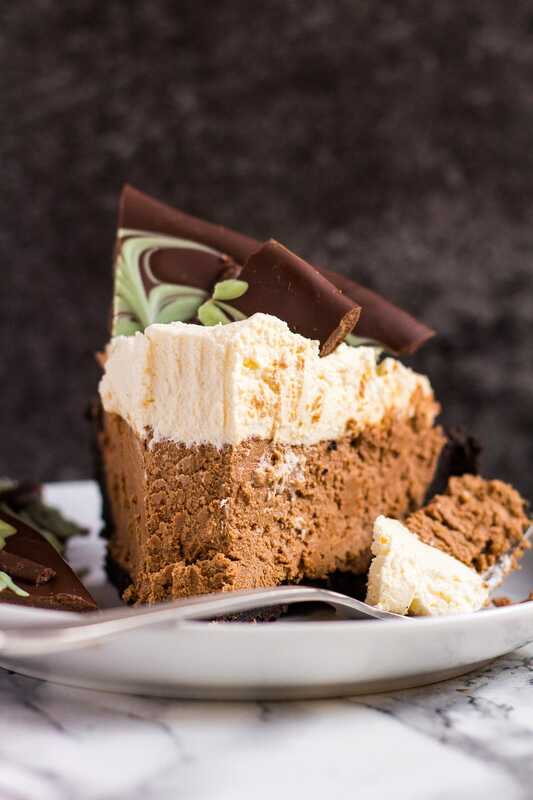 The PERFECT no-bake dessert for your Christmas table! Wanna know what I did with some of my leftover Mint Chocolate Bark? 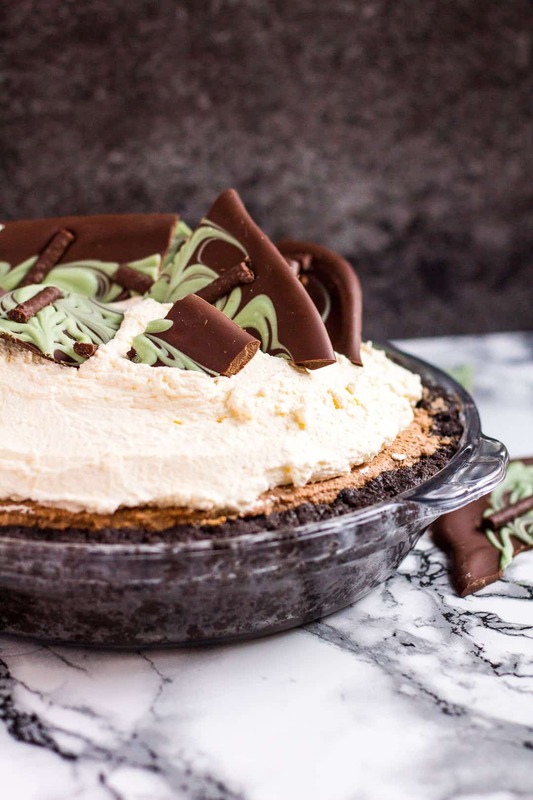 I topped this incredibly delicious No-Bake Mint Chocolate Cream Pie with it of course! Double the minty-ness… Mmmm. First, we have the Oreo crust. I used a LOT of Oreo crumbs to make a thick crust that goes right up the sides of the pie dish. 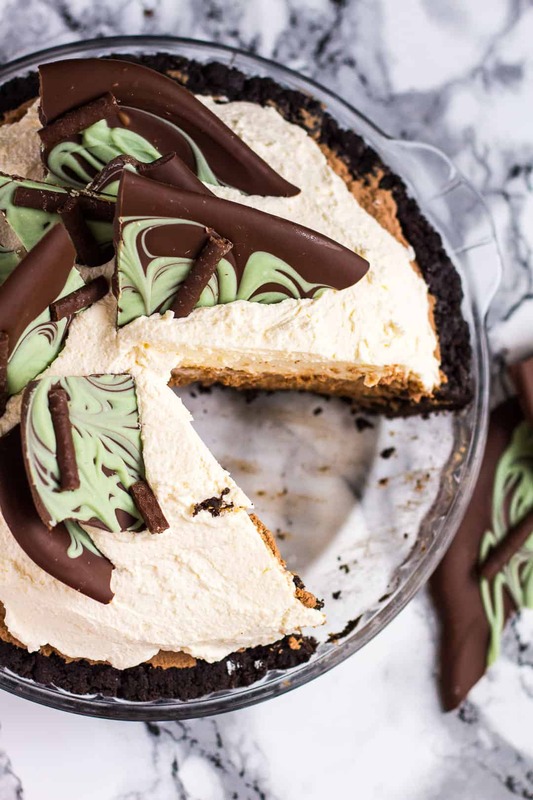 It’s the perfect crust for this mint chocolate pie. Next up is the mint chocolate filling. 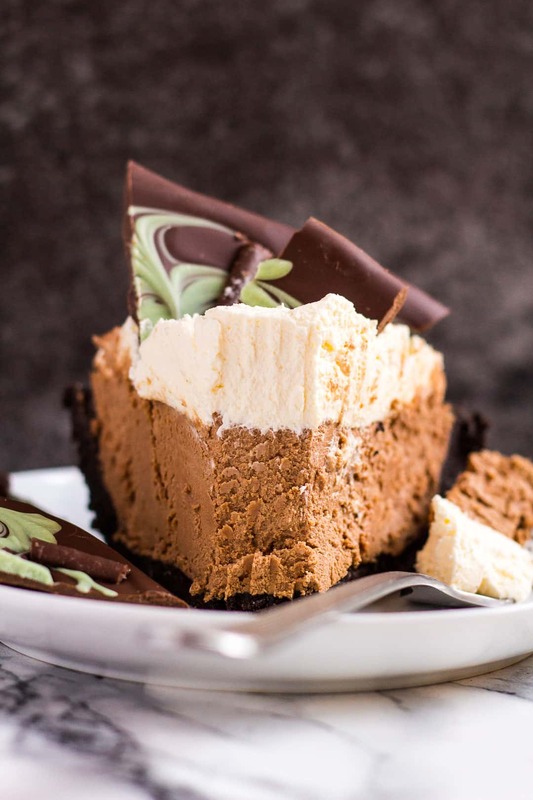 This mousse filling is super creamy, and melt-in-your-mouth, and is so full of flavour. You’ll be eating this by the spoonful before it even reaches the Oreo crust! Make these incredible pies next! 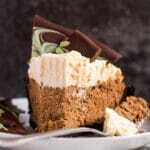 A thick Oreo crust filled with a deliciously minty mousse filling, and topped with a homemade whipped cream. The PERFECT no-bake dessert for your Christmas table! Mix together the Oreo crumbs and melted butter. Press the crumbs into a greased 9-inch pie dish, or springform pan, and refrigerate whilst preparing the filling. Add the chocolate, and 1 cup (240ml) of the heavy cream to a microwave-safe bowl, and heat in 30 second intervals, stirring after each one, until melted and smooth. Stir in the mint and vanilla extract, and allow the melted chocolate to cool completely. Using a handheld or stand mixer, whip the remaining 2 cups (480ml) of heavy cream to soft peaks. Add the cream cheese and whip to stiff peaks. Gently fold in the melted chocolate. Spoon the filling into the crust, and gently spread out evenly. Cover and refrigerate for at least 6 hours or overnight before topping. Using a handheld or stand mixer, whip the heavy cream until it starts to thicken. Add the icing sugar, and vanilla, and whip to stiff peaks. Make this pie ahead of time! Simply make the pie without the whipped cream topping, cover, and refrigerate for up to 2 days. Make the topping just before serving. This pie and any leftovers freeze well, covered, for up to 3 months. Thaw overnight in the fridge before serving. Oh my lord these pies are stunning. I love them. And John and I are big mint fans so I need to make these soon.